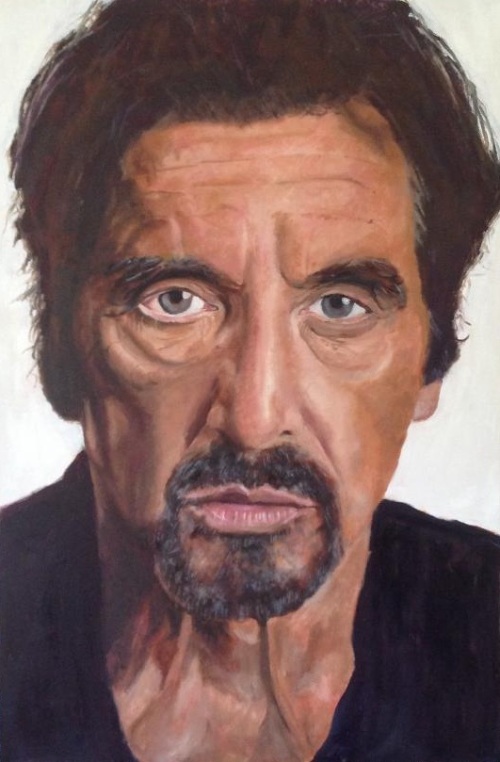 I found this great photo of Al Pacino that I’m going to do next. 1. 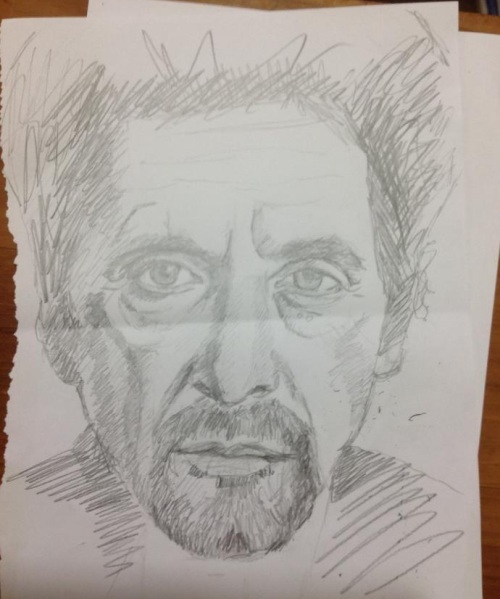 Here’s my initial sketch of Al. I’m going big with this painting (90x60cm) and I’m going to try and make it my most detailed portrait yet. 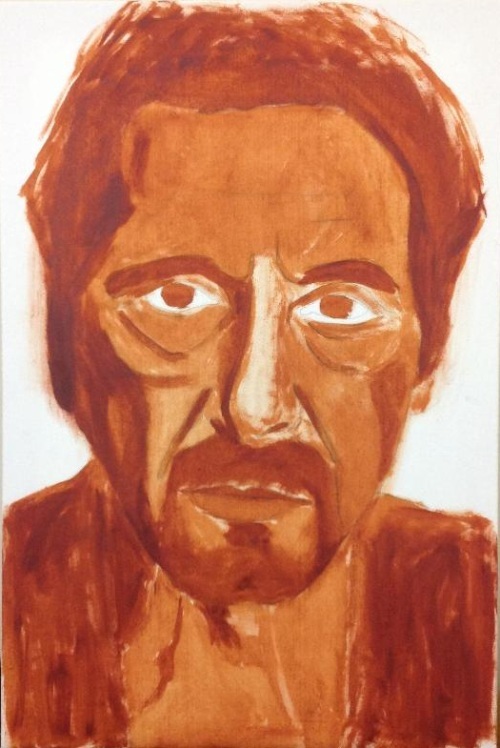 A thin layer of burnt sienna for the underpainting. This is transparent so you’ll still be able to see the white gesso underneath. 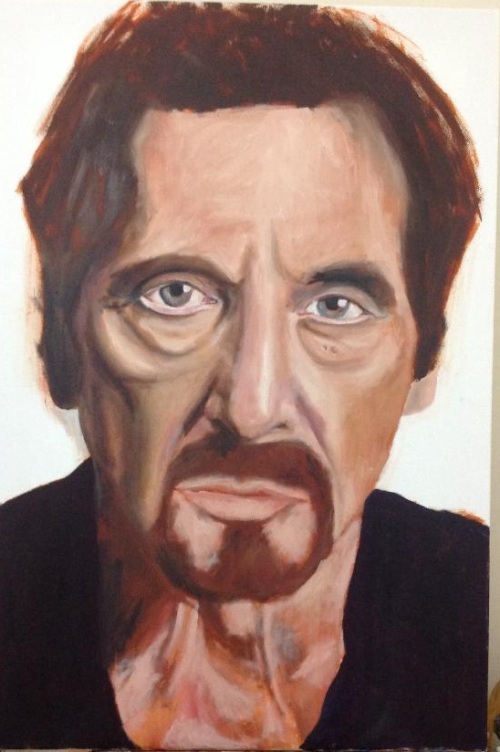 On top of that I’ll put a thin opaque layer for the lighter areas of the face using white, cad red and yellow ochre. On top of both of those there will be several transparent oily glazes where needed for the details. If I need to lighten any areas up after that I’ll scumble. 2. 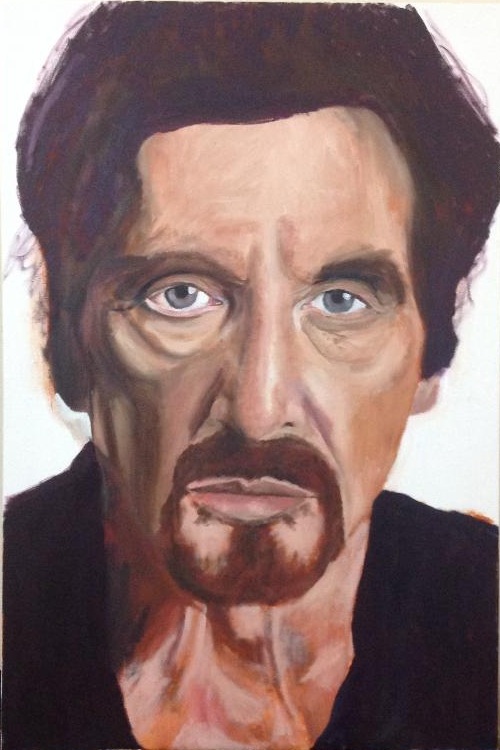 My Al Pacino underpainting, I bet the old masters would have been chuffed with this. There is a slight possibilty that I might have gone a bit over the top with the burnt sienna. My daughter came in and thought it was Will.i.am so it hasn’t started well. 3. Now for the lighter opaque layer of white, cad red and yellow ochre. I do quite like how the burnt sienna layer still shows through even though the colours are completely wrong. 4. Getting the colours right is the most difficult part of this whole process. I’ve lightened the skin tones again knowing that I’ll be glazing some darker layers on top shortly. Then I stared at both my painting and the photo for a while. When you stare for too long I find it becomes absolutely impossible to work out colour differences. Was my painted forehead lighter or darker in tone than the photo’s? In desperation I cheated and resorted to technology (sorry old masters). I downloaded a colour id app on my phone. The app identifies colours and gives them a name e.g. rosy brown, grullo, eggplant, that sort of thing and then gives it a hex number in case you’re working digitally. The problem is Al’s forehead registered about fifty different colours as I slowly scanned my phone across it (all with incredibly fancy names), even when I was trying to keep the phone still it kept flipping between three or four colours. The only bit of information that was slightly useful was the hex number. The hex number for black is #000000 and the hex number for white is #ffffff so for any colour if the first digit of the hex number is lower in the scale it’s a darker tone and if it’s higher it’s a lighter tone. 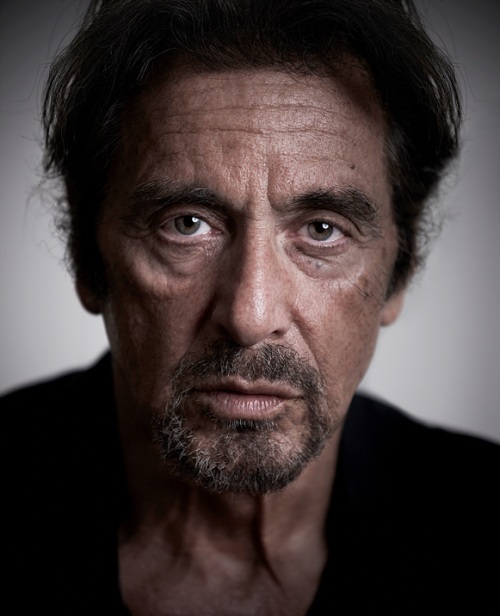 Back to Al Pacino’s forehead (photo). So what have we learnt from this analysis? 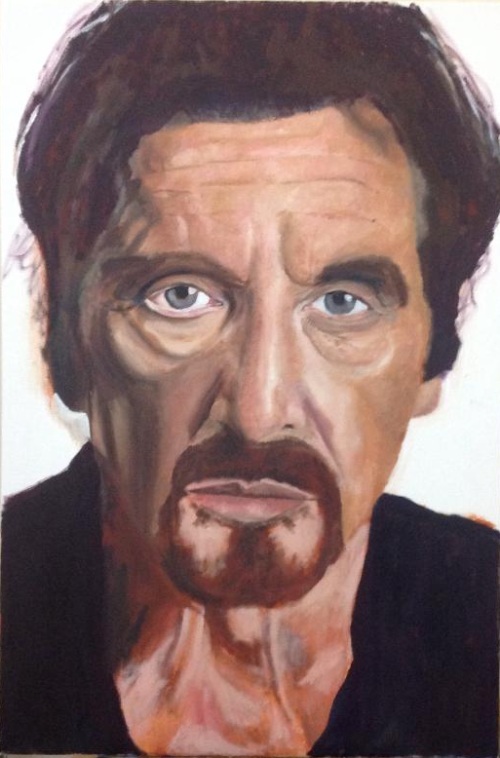 Left side – need a softer gradient of tone. Central – the highlighted areas need to be lighter. Right side – again more gentle tapering of the tone. The big question – was this a useful exercise? 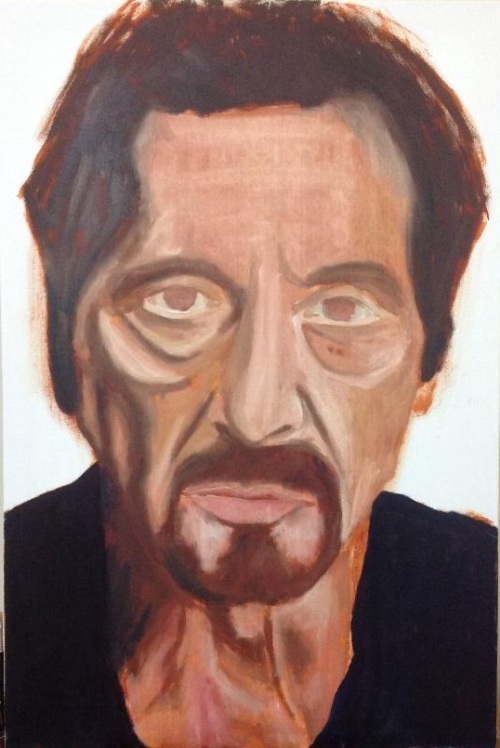 Let’s remain positive, the main thing I learnt from this was that I need to lighten a few areas of the forehead even more, just so the glazing phase doesn’t make it too dark. I haven’t really learnt anything about the colours because there were so many combinations and how do I accurately mix ‘eggplant’ anyway? Conclusion: I might use this app again if I’m unclear about the tone. 5. I decided to ignore all that forehead tone analysis on Friday and do the eyes instead. I can’t tell how a painting’s going until I at least make a start on the eyes. 6. I did some more work on the eyes and around the nose and gave him a boofy hairstyle. I glazed some burnt umber on the left hand side to darken his cheek a little but then I started a bit of scumbling around the nose with a very dry brush. This technique seems to have worked quite well because it imitates the imperfections of the skin. I think I’m going to scumble the whole of the forehead tomorrow and see what it looks like. 7. Scumbling the forehead, that’s all I’ve got to say about this. It took an hour. I also darkened the cheek on the right and put some strange blobs of colour around the hairline which look awful. He looks a little bit more psycho than the photo, but I quite like that. 8. Sorted out the hair, eyebrows and beard over the weekend so I think I’m finished.